Jack Singleton, age 85 of Ozark, Missouri passed away Friday, October 12, 2018 in his home from cancer. Jack was born October 18, 1932 in Douglas County, Missouri, the son of Ray and Ivy Singleton. On December 24, 1950, Jack was united in marriage to Betty Gott and they celebrated 66 years of marriage before her death on May 1, 2017. Jack was a dedicated employee of Kraft Foods and retired after 38 years of service. After retirement, he worked at Walmart, Lighthouse Lanes and Century Lanes Bowling. Jack was a skilled bowler and recently bowled a 600 series, he also experienced a close relationship and made lasting friendships with his bowling family. 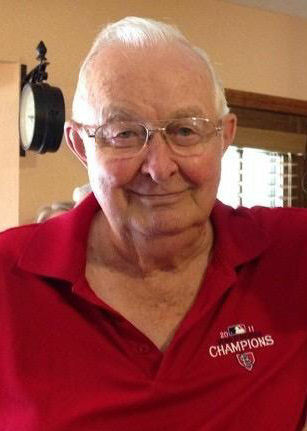 Jack was a fan of sports and coached little league baseball for eleven years, ten of those years they took first place. Jack also enjoyed attending and was a faithful member of Sparta Church of Christ and loved his church family. Jack was preceded in death by his parents and his beloved wife, Betty. Jack is survived by one brother-in-law, Wendell Gott; his children, Kevin Singleton and wife Debbie, Steve Singleton and wife Lynn, Tim Singleton, Tina Singleton Rodgers and husband Max. Also surviving are his grandchildren, Stacey Gibbons and husband Micah, Jeremy Singleton, Megan Singleton, Sally Moore, Travis Singleton and wife Brenna, David Rodgers and a special person to Jack and the family Quan Ngo. He had one great-grandson Garrison Singleton who loved his great grandpa and grandpa loved him. Funeral services for Jack will be 10:00 A.M., Tuesday, October 16, 2018 in Barnes Family Funeral Home, Ozark with Ted Spencer officiating. Burial will follow in Union Grove Cemetery, DD Hwy, Goodhope, Missouri. Visitation will be 6:00 to 7:00 P.M. Monday in the funeral home. Memorial donations can be made to Fair Haven Children’s Home, 3132 N. Fair Haven Loop, Strafford, Missouri 65757. Online condolences may be shared at www.barnesfamilyfunerals.com. I’m saddened to hear of the loss of Jack. Sending thoughts and prayers to your families. Jack was a very sweet man. Him and my Grandpa Glen (my bowling partner) loved to give each other a hard time. He always had a smile on his face. Such a joy to be around. Loved his bowling, sports, but his family was number 1. I remember Mr. Jack by how he treated me and how I saw him treat others, exceptionally kind and nice, he was easy to like, I will miss him. I am happy I knew him. His example was uplifting to me. I am sadden for the family, but rejoice for Mr. Jack. May God bless and comfort the family during this time of sorrow. Vickie and I are sad to hear this news. Prayers to the family. RIP Jack. I am saddened to hear of the passing of Jack. His wife Betty Gott Singleton was my third grade teacher and I have great memories of Jack and Betty as a young student at Silver Shade.